Looking for a little inspiration for your next holiday party menu? 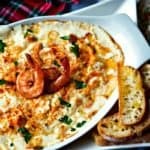 Cheesy Shrimp Dip makes a delicious hot appetizer that your guests will literally devour in seconds! Combine three different types of cheese — cream cheese, shredded mozzarella, and Parmesan cheese — with a sautéed shrimp scampi and bake until hot and bubbly. 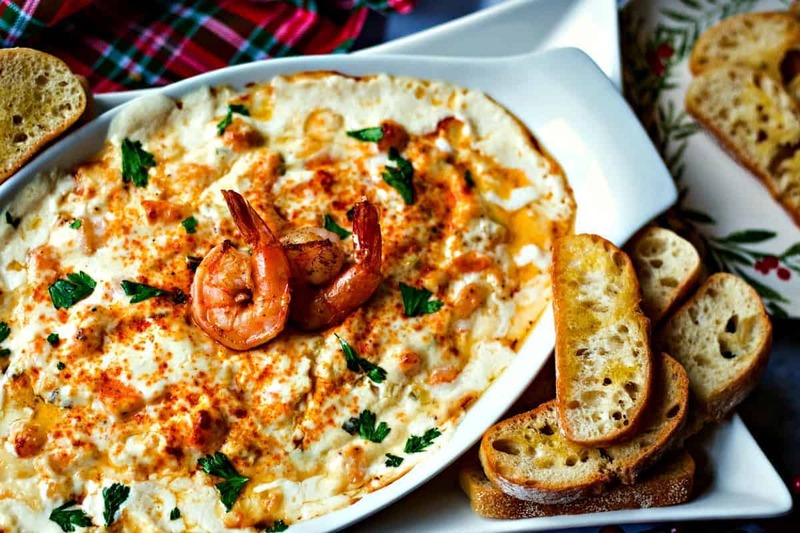 Serve this deliciously creamy hot shrimp dip with pita chips, assorted crackers, or even a sliced and toasted baguette. This easy shrimp dip recipe is made with a half pound of fresh shrimp, but you can add more if you would like your dip to be chunkier. This dip is so easy and so cheesy and so delicious! You may have read in my last newsletter that I recently had eye surgery to repair a macular hole. These last six weeks I’ve been recovering and just the last week or so have started to feel normal. Prior to my surgery, I hadn’t really done anything to get ready for the holidays, so I’m feeling particularly behind this year! On top of that, I’m headed to St. Louis the week after Thanksgiving to stay with my daughter and help with our new grand baby that’s due to arrive soon—you just don’t know how excited we are to meet our grand baby!! 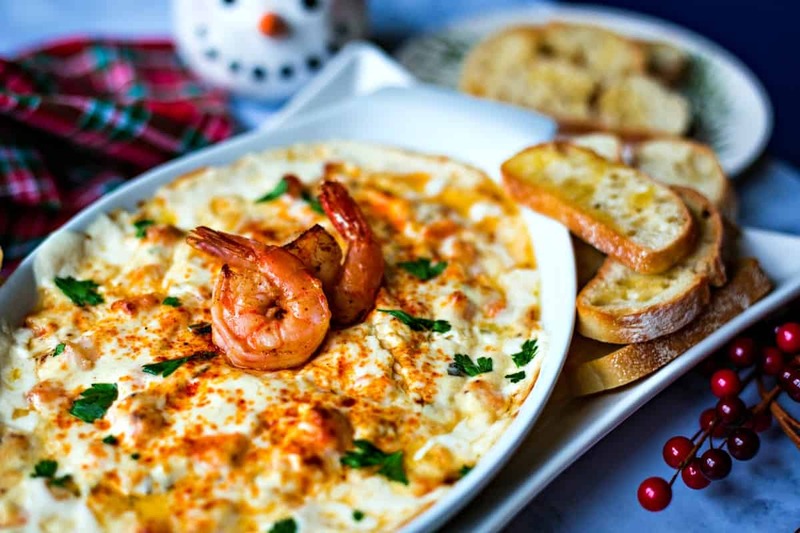 With all that, I love EASY and SIMPLE holiday recipes like this one for Cheesy Shrimp Dip. This is one of the recipes that I’ll plan to prepare while I’m in St. Louis celebrating Christmas away from home. 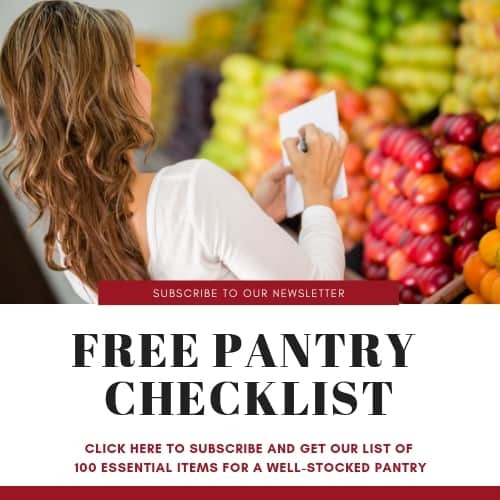 We may be a little distracted with the new baby, so easy is good for this year! Start with a half pound (or more) of fresh shrimp that has been peeled and deveined and give it a rough chop. Make the scampi. Sauté the shrimp in butter with garlic, fresh lemon juice, and green onions until the shrimp are pink. Add the cream cheese to the pan and stir until melted. Next, add the remaining cheeses and two tablespoons each of mayo and sour cream. Once all the cheese is melted, pour into a lightly greased baking dish and sprinkle with more Parmesan cheese and smoked paprika. Bake in a 350-degree oven until hot and bubbly. Before serving, garnish with a few more sliced green onions or parsley if you like. Serve with crackers, toasted baguettes, or pita chips. One thing I love about this hot appetizer is that it can be mixed up ahead of time. Just do all the stove top steps in the recipe, then cover and refrigerate. Thirty minutes before your party guests arrive, pop the dip into a preheated oven and bake until hot and bubbly. Now, tell me, how can you go wrong with a warm cheesy dip?! Hot Pepper Jelly Cheese Dip with Bacon — Sweet and salty with a little bit of heat, this Hot Pepper Jelly Cheese Dip with Bacon is irresistible at holiday parties. Baked Jalapeño Pimento Cheese — Adjust the heat to your tastes by adding more roasted jalapeño peppers to this lightened up Baked Jalapeño Pimento Cheese. Easy Spinach Artichoke Dip — This hot dip requires just five basic ingredients! Sausage, Bean, and Spinach Dip — Serve with corn chips because this hearty dip demands a hearty chip! Warm and Cheesy Crack Dip — Be careful, this dip is addictive! 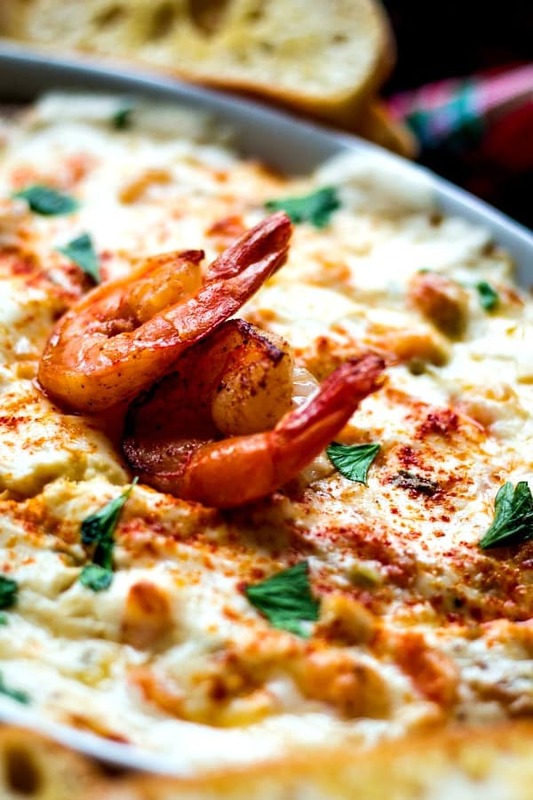 Did you make this Cheesy Shrimp Dip recipe? 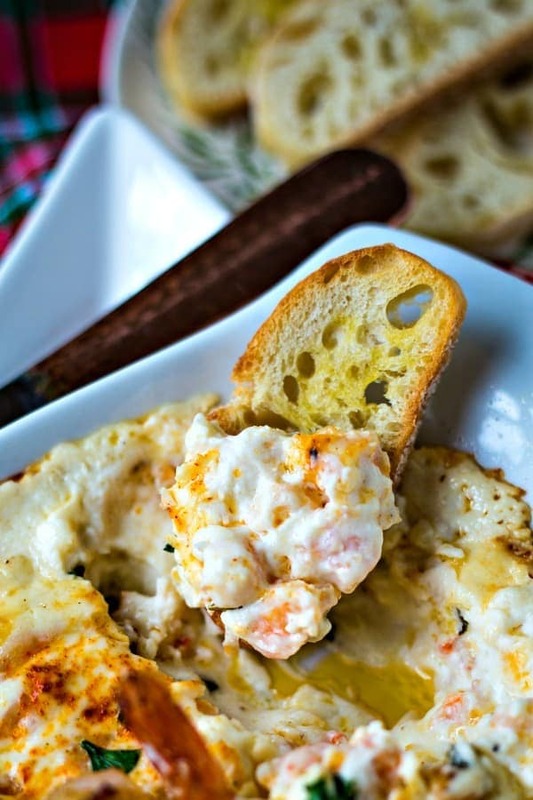 Cheesy Shrimp Dip makes a delicious dinner party appetizer. Serve hot and bubbly with pita chips, a sliced and toasted baguette, or assorted crackers. Coarsely chop shrimp. Melt butter in a skillet over medium heat. Add shrimp, garlic, and green onions and cook just until the shrimp are pink, 2-3 minutes. Stir in lemon juice. Reduce heat to low and add cream cheese, stirring until melted. Add sour cream, mayo, Parmesan and mozzarella cheeses and stir until combined. Season with salt and pepper, then spoon mixture into a 1-quart baking dish and sprinkle top with paprika. Bake for 30 minutes, or until lightly browned and bubbly, Serve with pita chips or crackers. What I be able to make this recipe in a crockpot just throw it all together and put it in the crockpot , I wouldn’t use raw shrimp I would just use cooked shrimp. Tara, I believe that would work. I like it in the oven because the cheese browns nicely. The is my 2nd time trying this. My neighbour and kids so loved it I had to make again. It’s so so delicious!! 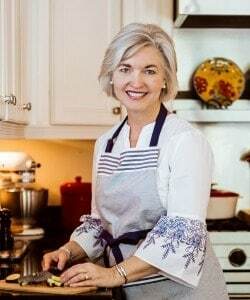 Thanks for your recipe and can’t wait for your new post!! I made this last weekend and everyone loved it. It was absolutely delicious! Oh, I am so happy to hear that! Glad you enjoyed the dip! This is a delicious recipe!!!! I spiced it with up with some mild chopped chiles and mild chopped jalepenos. So Yummy ~a big Hit at our Mexican Fiesta!! Oh, that’s so wonderful to hear! I want to try it with the chilies now! Hi, Kellie! You can certainly make up the dip the day ahead and wait to bake it until just before you are ready to serve.